Galactic energies and Galactic Presences are present on our beloved Earth, in our reality and in ourselves. This is very clear more than ever and it cannot be denied anymore, at least that is my personal opinion and experience. I have had so many Galactic experiences that I decided to share them all with you; dreams, real experiences in daytime, in conscious ways…. I am as excited as you all are and it is also one of my missions to bring things out about the Galactics and to work on disclosure so this is what I am going to do now, bringing out my personal experiences to begin with.. The first time I had a “contact” with one of the galactics in a conscious way was with the Arcturians. I saw this group and forms of white energy moving around me and I felt as if they were touching me and it felt warm. They started to talk to me and they presented themselves as the Arcturians to me. They are so gentle and highly evolved Light beings, who are friendly and loving, but also very direct and clear in their intentions and messages. They were often around me in their energetic forms and I could sense them and see them moving around me all the time. Mostly when their Presence was with me, it meant that a download, a transformation process or a transmutation had to be done. Every time a big step was taken by me, they were there to assist me with it, through their high technology and energy. Often they perform a healing and clearing, a sort of scan to see how far my body was in its transformation process or I just went aboard their ship in one of their energy and healing chambers of Light. When this was the case, I could feel myself aboard their ship and lying in a sort of cabin of Light. Every time such process was assisted by the Arcturians, Light codes and geometry codes were coming in and were absorbed in my being. I could see them and with every one of these patterns and codes, the Arcturians explained to me what it meant. I could understand them, but after 5 minutes it was gone so I can’t recall any of them at this time. But it’s perfectly normal as they are now integrated and understood by my being, which is the most important thing right now. I do recall, while being in the Alpha state, (which is a state between awake and sleep, like you are just before falling asleep) I was being taught a sort of language which was a galactic one. 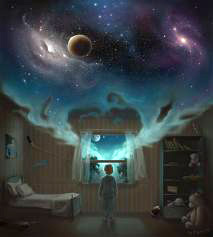 At this state, just between being awake and being asleep, is the place where a lot of things happen on a conscious way. It is just as you are asleep, but you are not and you are still here. Often I open my eyes during it and feel with my hands if I am still in my bed, while feeling myself floating in some kind of state and vibration. When I am on the ships and this is happening in this state and not during dreams, it is always in that way that I see and feel that I am somewhere else, while still being in this reality and body. It is called traveling through the dimensions in your state of being. We are doing this often, some more than others, some on a conscious way and others not so conscious. I even do this while just sitting in a chair and starting to look with my third eye. I feel myself floating to another place while sitting in my chair consciously. I start to see things around me becoming waves and energy and there are no material shapes anymore. My bed or computer is just moving suddenly and it feels as if I can put my hand through it as it is not a solid material anymore but instead a wave of energy, close to each other, a holographic thing and creation. This brings me to my experience with my first “real” contact with my Pleiadian family of Light… Now that was an important lesson for me to learn and now I can laugh about it. I was told last summer that I would be visited by the Pleiadians, they gave me a date and an hour and told me they would come down to earth with a small ship on my property on a big field beyond my yard. I was allowed to tell my friend and we would “see” them. The day before I was sitting in my yard, looking at the field where they were expected to land and visit me.. I suddenly saw this blue form standing next to me. It was just standing there very silently as if it was waiting for me to make a connection, which I did. He called himself Peter the blue Pleiadian, who I was familiar with from former channeled messages I once read on the net. He told me that he came to make some agreements on things and prepare me for the encounter the day after. He explained to me that he would be the captain of that small ship, and that my Pleiadian father Zatu and my Pleiadian mother Ty would be aboard accompanied by my whole family and by Master Melchizedek, who is my brother as an Ascended Master of my Ascended Lady Master being, and Melchizedek is also a Pleiadian aspect. My Twin Flame being an Ascended Master would join them too. We talked a bit and so it was very clear to me that this was truly it! The big deal!! As nervous as I and my friend were the next day, we sat at the exact agreed time waiting and were staring at the field. They contacted me and told me that they were about to land and decloak soon, while suddenly there were humans coming from nowhere on that field, just walking, while there was never one soul on it before!! So we had to wait a bit longer and when the time finally arrived, we could not see them. At least my friend could not see them, I could feel them but not really see as I expected to see them with my physical eyes. They said they have landed and stood next to us, I could see and feel a bit but not really the way I was hoping for. Seems we were too excited and placing expectations on it, which is a disturbing factor. That day, doubts were arising and I let go of the issue and everything related to it for a while… A few weeks later, I was standing outside, looking at the stars and enjoying the beautiful sight. Suddenly a voice popped in saying: “Méline we are here with you, can you see us?” They were the Pleiadians talking to me and I saw a few light energies, forms moving and standing around me. “Yes” I replied, “I can see you, I think?! Are you these energetic light forms that I am seeing?” “Yes, that is us” they replied. They shared that their ship was also on my property and it was an energetic one, entirely on my ground overlapping a piece of my house as it was bigger than my property. They said that I could see the ship now if I wanted to because I could see them, and this was the case! I started to look through my third eye, without expectations and there it was!!!! I was so happy to finally see it! It was a blueish energetic ship in the form of a disk. It seems that I could see it now because I let go of my expectations of seeing a material ship. They explained to me that how you see a ship depends on how far you are awakened and what your state is. If you are more in the state of 3D, the ship you will see will be one of lower vibration and the higher the state you are in the more you can observe energetic and Light ships, for actually they all are energetic light ships which they can cloak and decloak and take on any form they want. So that might explain why I never saw an ufo of a material shape. Another experience with the Galactics was a private tour on board of an Arcturian ship under the guidance of my Twin Flame and SaLuSa. They both talked to me and introduced me to other civilizations. While receiving the tour, the voices and explanations came in clear but the only thing I saw, were flashes of images while receiving explanations. Again I was in this Alpha state just before falling asleep, because I could move my arms and feel my mattress lying under me. While they introduced me to the Arcturians, an image of greenish beings with black eyes came in. They had a small forehead and the back of their head was large and wide. Their ships were round like a bal. Then came the introduction of the Pleiadians followed with images of humanlike beings with long blond hair and clear blue eyes, they felt the most familiar to me and their ships were the form of disks and some were disks with a little dome in the middle. Then the Sirians were introduced to me, but from them I received no images as it seems that I was not comfortable with their appearance back then, as these were the blue race. I did see their ships and they were more triangular shaped. Now I do know how they look and they are very close to looking like the avatars in the movie Avatar. These are all friendly and intelligent beings and were very warm and loving to me. Not so long ago I had twice the dream of cloud ships decloaking themselves while flying and moving towards the window in my bedroom. The first time these Galactic beings, who I still don’t know who they are, were standing at my window and they were smiling at me and making contact telepathically. I remember that I was looking for my camera to take pictures of them, but it did not work at that time. So suddenly a connection was made with my being, and I went into a blissful state and after that I just woke up. In the second dream it was a ship coming to my bedroom window and again I was trying to take pictures, but to no avail as the camera did not work. Again when the connection was made, a blissful state was a fact and immediately after that I was awake. It all points out to the contact that is already made in a more unconscious way and that it is now presenting itself in a conscious way into my and our reality. It is like the Pleiadians once told in one of my channelings; that we would know and feel that they are of Light because the blissful state of Love will take you over and this was absolutely the case. You become one with them. So contact is already going on for a long time sweet hearts! As I have told in the radio show of Maarten Horst last thursday, I see and feel more Galactic energies and beings around me, conscious and in my dreams. Last night I had again a dream that had the message that all is so close. When our Galactic Family came to my window bedroom in the former dreams and when contact was made it felt like recognition of yourself and suddenly a state of bliss is felt as if the body is no more and there is just: being! Last night I dreamt that I went to the store and there was quite a special man with clear blue eyes behind the counter and he was always smiling, happy and so full of love! It felt as if nothing could ruin his world full of happiness. When everything I bought was scanned and we came to the point where normally I have to pay, he put everything in bags and just smiled at me as if he knew me, a sort of recognition. He did not ask for payment at all and wished me a wonderful day! I went outside kind of in a haze about it and saw that no one had to pay at all! So I took my bill and on that bill was his picture and his name with a few lines that stated: “We are coming from a 3D reality and now have reached a 5D reality, therefore all is free and in abundance all out of Love and harmony! Exchanging is now the new way. I wish you a blessed day and much Love.” Suddenly it just became clear to me that he was a galactic in human form! He came here to set things straight and that is why he was so happy and looking at me while giving me the feeling that he knew exactly who I was!! I could feel it after that on a big scale because it all made sense now and I just knew and saw what it was all about. It is also duly felt by others around me, as they too have dreams of Light coming out of the Earth (inner Earth) and of Galactics, even the not so awakened ones are telling me this. So again it all points out to something Galactic presenting itself to us, the alignment with their energies, their Presences, with ourselves. The becoming one again with them. These energies are so strong nowadays and even at night I often get the message to go to bed early as they need me to offer my services and I need to be asleep to enable this and leave my body. This I have experienced not so long ago and I could feel myself wanting to leave my body, but the sleep modus was not active yet so I felt myself being pushed back into my body a few times until I was fully asleep. That night I did everything consciously and I can remember every single detail of my mission, but I am just not allowed to share as it was top secret. I even felt it strongly that I was doing something dangerous together with my Twin Flame who is in fact already doing so much for this world, and we had to be extremely cautious during this mission.